The timeline shows the results of resource calculation and forecasting based on the data in your plan. It provides visibility into forecasted release dates, timing, teams, and members. Epics and stories are scheduled, as well as details and bottlenecks. How do I see the release start date? The grey indicator marks the release start date. Which indicator defines my current day? The orange dashed-line indicates "today". What are the start and end dates of the work items? When you select a work item, you can see the start and end date of that item marked in blue. How do I know that a release is overbooked and what does it mean? 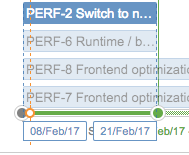 When a release is overbooked, the timeline displays in red the time that the overbooking applies to. An overbooked release implies that you have assigned more work to the release, than the work that can realistically be done in time for the manually assigned fixed end date. How do I identify that the release is going as planned? The green line indicates that there is no overbooking and the project progress planned on time. It is period between the computed release date and the manually fixed date. In the following example it is the line that goes from the 21st February and the 1st June. If the issues assigned to a release are completed before the release end date, the release will still have time without tasks, that period of time is the buffer. How do I see the difference between manually assigned fixed date and calculated release dates? The manually assigned fixed date is represented with a green ball that has a white border, and the calculated end date is white with a green border. Choose your plan and go to either scope, teams or releases view. The timeline is located at the top of the page. Make sure that Schedule is selected in the configuration bar as shown in the picture below. Click a work item to see its forecasted start and finish dates. Once you click an item in the timeline, a new window shows up with the issue detailed view, dependencies, and description. Change the view by clicking more ( ) and selecting the schedule settings. スプリント Display the timeline as filtered by sprint color. When you click the sprint name, you'll see the sprint capacity availability and usage. Learn more about the capacity view. You can hide the timeline by selecting the X icon. To display the timeline again, click Show timeline, which is located next to Calculate. When you make changes to your plan, and click Calculate to ensure these changes reflect in your plan. Hover over the timeline items to see the issue number and name. Click the timeline issue to see issues with dependencies, and the corresponding issue details in the scope view. The teams in the plan must be assigned to boards as issues sources. Go to your plan > Teams > and select the the board you want to use as issue source. Click Calculate to refresh the timeline. 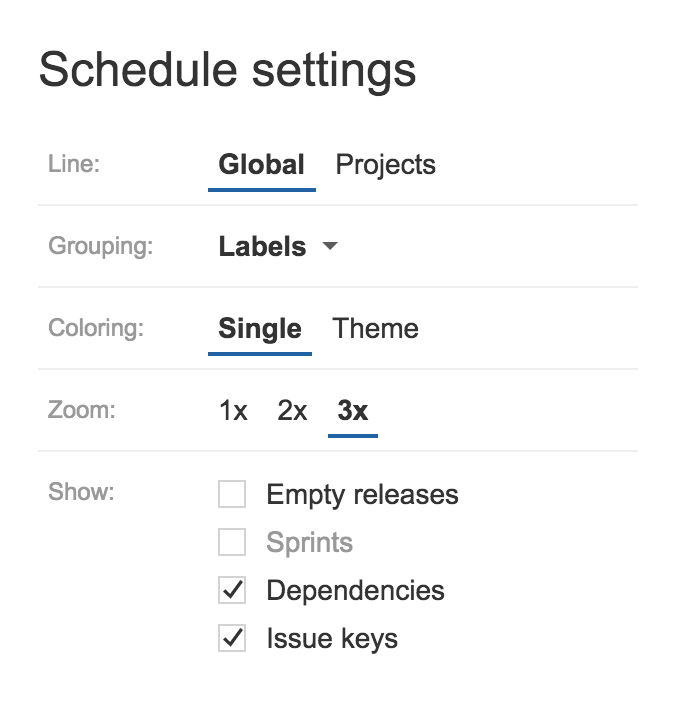 In the schedule section, select > select the Sprints checkbox to see sprints in the timeline.